Frank Akins would one day have a great nephew who would be determined to see that the sacrifices of his long-dead relative received proper recognition. A police detective by training, Marty Beatty started in 1994 to gather evidence that Frank should have received military decorations for the incident outside Fismette that led to his death. He had put his life on the line, volunteering to go into no-man's land to retrieve wounded comrades. Almost all the material incorporated into this article is due to Marty's efforts at gathering evidence to this end. At this writing, Marty is still pursuing the part of his mission concerning recognition of Frank's heroism on August 12, 1918. It has always been clear, however, that in being wounded in this action, he should have received the Order of the Purple Heart. In January 2001, Marty Beatty presented his evidence to the Department of the Army. 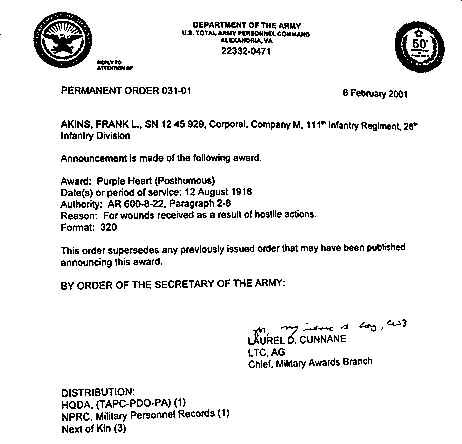 On February 6, 2001 the United States Army published the order awarding the Purple Heart posthumously to Corporal Frank L. Akins [see below]. 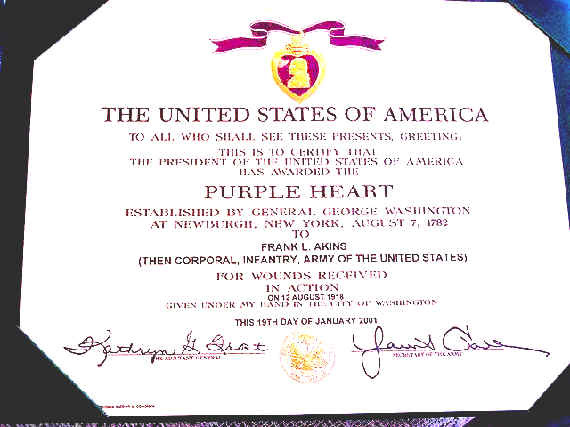 By remarkable coincidence, the family received Frank's medal, February 26, 2001, the very day America and the Akins Family Lose a Son went on-line at the Doughboy Center.